Clemson Girl: More Orange and Purple Dresses - Perfect for Clemson gamedays! More Orange and Purple Dresses - Perfect for Clemson gamedays! Macy's must be a closet Clemson fan. 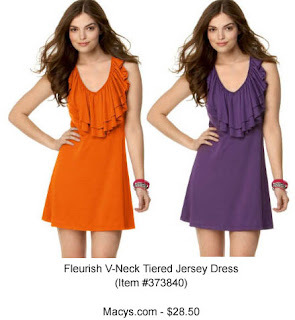 Not only are they having a great sale on their Web site right now, but a lot of their dresses come in orange and purple! There are too many to post in this post, but I'll feature some of my favorites. This basic orange dress has a nice fit to it and looks comfortable. It would look great with gold jewelry (Clemson of course) and gold flip flops or sandals. I would probably pair it with a white tank top underneath since the neckline is a little low for my taste. Afterall, Clemson games are family friendly. :) It is also available in purple, but the purple doesn't look like the right shade. Am I seeing double? 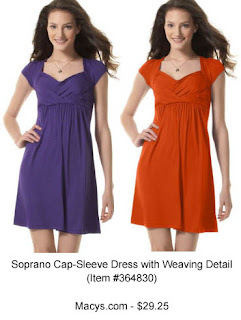 This adorable cap-sleeve dress comes in both purple and orange! I like this dress because you could wear this to the hot games with flip flops and to the cooler games with a jacket and knee high boots - making it well worth the $29.25 price tag. It might actually be worth purchasing one of each color! I loved this dress when I first saw it - it's fun and flirty and no gameday tan lines! However, I wasn't a big fan of the black belt - I'm wearing it to a Clemson game, not Halloween. The belt, though, is detachable -- so you can use any other belt you'd like (or none at all). Wet Seal has some great selections of pretty inexpensive belts that come in various colors. The one pictured above comes in purple, gold, brown - or any other funky color you wanted to pair with this dress. I love, love, love this dress. I really like the rosette detail around the neckline of the dress. I also like that the waist is fitted to help define your figure. This dress would be so cute paired with simple, silver Clemson jewelry and tan or brown flip flops. The dress is so effortless - you'll look all dolled up for the game by just putting it on! Another dress from Macy's that is available in both orange and purple. This dress features a unique neckline that's great for those of you who are like me and aren't as blessed in the chest area as others. The dress looks super comfortable and looks like it has a very easy fit - not too clingy. I think the orange dress would look great in September paired with gold, purple, or orange flip flops - and great for the cooler games in October with a tan corduroy, mid-thigh length jacket and brown knee high boots. Again, at only $28.50 you might be tempted to buy one in each color! So...what do you think? Would you wear any of these dresses? Which one is your favorite? Which one is your least favorite? 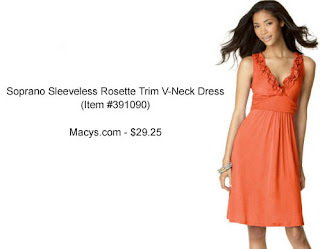 I bought the orange cap sleeve dress from Macys online! I ordered a small and, unlike the pictures, the dress actually reaches my knees. However, I am a petite person. Cannot wait to wear it to games!